Violinist Carrie Krause’s, “elegant, sparkling performance brought audience cheers,” — Seattle Post-Intelligencer. From Fairbanks, Alaska, Carrie Krause performs as a baroque violinist with groups across the nation and on numerous international series. She recently performed as soloist in Alice Tully Hall, Jordan, Hall, and the Thomaskirche. She served as guest artistic director of Seattle Baroque, concertmaster of New Trinity Baroque, as guest concertmaster of Pacific Baroque and the San Francisco Bach Choir, as associate concertmaster of Apollo’s Fire, and with such groups as American Classical Orchestra and Concert Royale in NYC, Chatham Baroque in Pittsburgh, Portland Baroque, the Baroque Chamber Orchestra of Colorado, and Spire in Kansas City. Festival engagements include the Spoleto Festival, Belgrade Early Music Festival in Serbia, Sastamalla Gregoriana in Finland, Utrecht Early Music Festival, and the BBC Proms with Apollo’s Fire. She founded the I-90 Collective, a baroque ensemble, which performs a house concert series across Montana and Baroque Music Montana, which offers a concert series and workshop with visiting teaching artists. 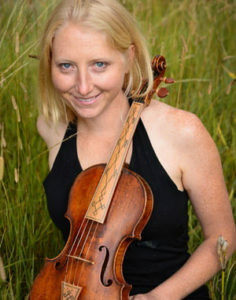 Carrie serves as concertmaster of the Bozeman Symphony, and completed her second master’s degree through The Juilliard School’s Historical Performance program.